The Sikkim water security and Public Health Engineering department have said Gangtok will get additional 21 million litres of water every day from early next year and the duration of supply would be increased to three hours. Currently, Gangtok that has a population of over one lakh gets 21 million litres of water daily and it is supplied for an hour. Namchi in South district would also get additional water supply from early next year, officials said. According to the Gangtok municipal corporation mayor, Shakti Singh Chaudhary, the town has around 27,000 households. Water is pumped from the Rateychu river to a treatment plant at Selep from where it is distributed across the town. The chief engineer of water security and PHE department, T.T. 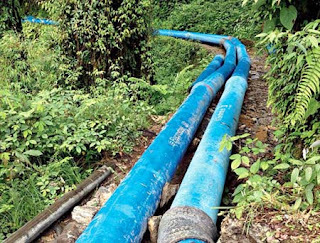 Bhutia, said another pipeline was being laid to pump water from the river. "The laying of 14 inch pipes on a stretch of about 14.5km from the Rateychu river to the treatment plant at Selep is on. The work would be over by the end of the year. Also, construction of another water treatment plant at Selep is going on. The additional water supply would be a New Year gift for Gangtok residents," he said. The cost of the project that started in 2011 is Rs 72 crore. "The project was supposed to be completed in 2014. It got delayed because of the 2011 earthquake," said a senior official. Bhutia said the department would introduce a water meter system. "People will pay water bills according to usage. The system would be launched in June 2017. The tariff is yet to be fixed," he said. Now, every building owner in Gangtok has to pay Rs 90 a month for water usage irrespective of its size or the number of people in it. "There has been an increase in Gangtok's population by almost 50 per cent in the past few years. With the additional supply, there would be no dearth of drinking water," Bhutia added. According to him, in Namchi, the water supply would be increased from 1.75 million litres to 3.86 million litres every day from next year. The town has around 3,000 households. Officials said the project that was taken up in 2014 costs about Rs 41.5 crore. Raju Tamang, a hotelier in Gangtok, said in the peak season, an extra 1,000 litres of water was needed. "We bring water from Burtuk by paying Rs 1,500 for 1,000 litres in the peak tourist season (April to May and September to November). Even with the additional supply, there would be scarcity," he said.